Funko is at London Toy Fair and they're dropping hundreds of new releases today. If you happen to be a fan of the Persona series, you'll be happy to know that a series of Pop figures based on Persona 5 are among them! 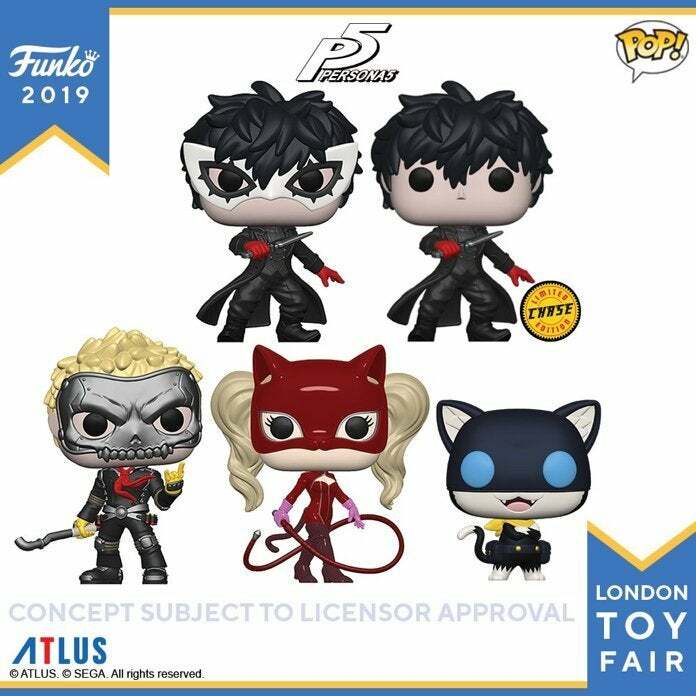 The collection includes Morgana, Ryuji Sakamoto, Joker (with Chase version), and Ann Takamaki. You will be able to pre-order all of the figures right here at some point today, January 21st (if you don't see them right away, keep checking back - they will go up eventually). "Persona 5 is a game about the internal and external conflicts of a group of troubled high school students - the protagonist and a collection of compatriots he meets in the game's story - who live dual lives as Phantom Thieves. They have the typically ordinary day-to-day of a Tokyo high schooler - attending class, after school activities and part-time jobs. But they also undertake fantastical adventures by using otherworldly powers to enter the hearts of people. Their power comes from the Persona, the Jungian concept of the "self;" the game's heroes realize that society forces people to wear masks to protect their inner vulnerabilities, and by literally ripping off their protective mask and confronting their inner selves do the heroes awaken their inner power, and use it to strive to help those in need. Ultimately, the group of Phantom Thieves seeks to change their day-to-day world to match their perception and see through the masks modern-day society wears." "Ren Amamiya is about to enter his second year after transferring to Shujin Academy in Tokyo. Following a particular incident, his Persona awakens, and together with his friends they form the “Phantom Thieves of Hearts” to reform hearts of corrupt adults by stealing the source of their distorted desires. Meanwhile, bizarre and inexplicable crimes have been popping up one after another… Living an ordinary high school life in Tokyo during the day, the group maneuvers the metropolitan city as Phantom Thieves after hours."